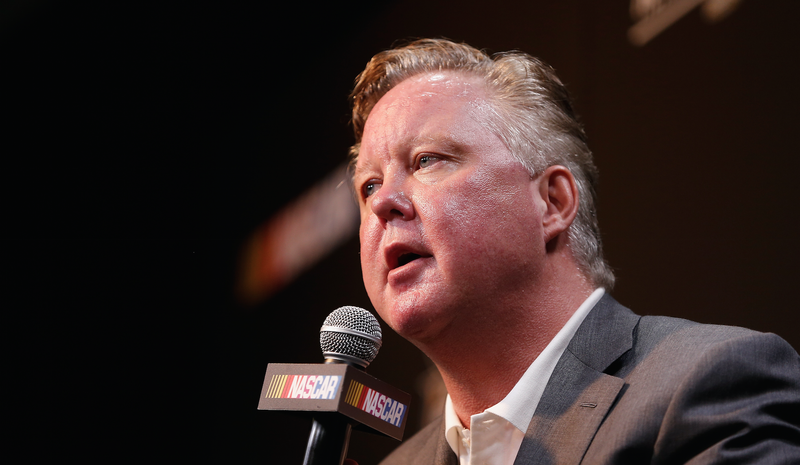 Ahead of the NASCAR Sprint Cup Series finale at Homestead-Miami Speedway, NASCAR CEO Brian France discussed the future of the sport, its search for a title sponsor and various other subjects. Perhaps his most defensive answer came in response to his support of president-elect Donald Trump. The day following the crowning of the first foreign-born champion in a NASCAR national series, Mexico’s Daniel Suarez, the topic of NASCAR’s diversity efforts in relation to France’s public support of Trump during the campaign came up. Drivers Bill Elliott, Chase Elliott, Ryan Newman and David Ragan were among others who voiced support for Trump during the same rally that France did. When asked about his support of Trump and diversity efforts in the sport, France stopped a reporter before the question was over. France sounded fairly defensive in the stream of the conference, but you can decide for yourself. The question and his response are below. Q. Brian, as you celebrate your first foreign driver winning a NASCAR championship, certainly there will be those who will raise questions about your support earlier this year of the president‑elect Donald Trump. BRIAN FRANCE: I’ll stop you right there. First of all, nobody wants to hear my political views. Not one person on this stage wants to hear from me politically. So I won’t be talking about that. But on my diversity, nobody, nobody in this company, has worked harder, done more and resourced it better than me. I founded the Diversity Council. I fought for every single thing that makes sense, because that’s my core belief about diversity. It’s very, very important. I talk about it frequently. And my efforts there should never be challenged, no matter what my political views might be. That’s a ridiculous thing to do. The question and answer can be found at 5:55 in the full video of the press conference below. Obviously, we’re very proud of Daniel Suarez last night in an unbelievable run and winning the championship. Historic for the sport in many ways. I got some nice calls from people south of the border last night that are very proud of him, and we’re very proud of him. We’re very proud that it validates our diversity plan in a significant way. All kinds of conversations on what we’ve said through the years is these things take time to find the kind of talent that can actually compete at a high level on the biggest stages, and he’s done that. So we’re very proud of him. I would tell you, without the Drive for Diversity program, with certainty, Daniel Suarez is not in NASCAR. We’re very pleased with that program. On the topic of NASCAR’s Drive for Diversity program, two alumni and current national series drivers have made history in the past few years. Suarez became the first Mexico-born driver to win in NASCAR national series competition with his Xfinity Series victory at Michigan International Speedway in June, and in 2013, Darrell Wallace Jr. became the first African-American driver since Wendell Scott in 1963 to win a NASCAR national series race. For clarification on the national series records, NASCAR’s “national series” are differentiated from its smaller regional touring series. The sanctioning body’s Camping World Truck Series, Xfinity Series and Sprint Cup Series are its three national touring series. In 2015, NASCAR changed the location of its post-season awards banquet for the Camping World Truck Series, the Trump National Doral Miami, over comments Trump made about Mexican immigrants. The move was due in part by Camping World CEO Marcus Lemonis’ claim that he would not attend the banquet at that location because the company would not associate itself with such beliefs.